Continuous delivery has quickly become the choice method for faster, safer and more frequent software deployments. As more and more tools come into play in this arena, developers are looking for new ways to enable this kind of software delivery and maximize its benefits. 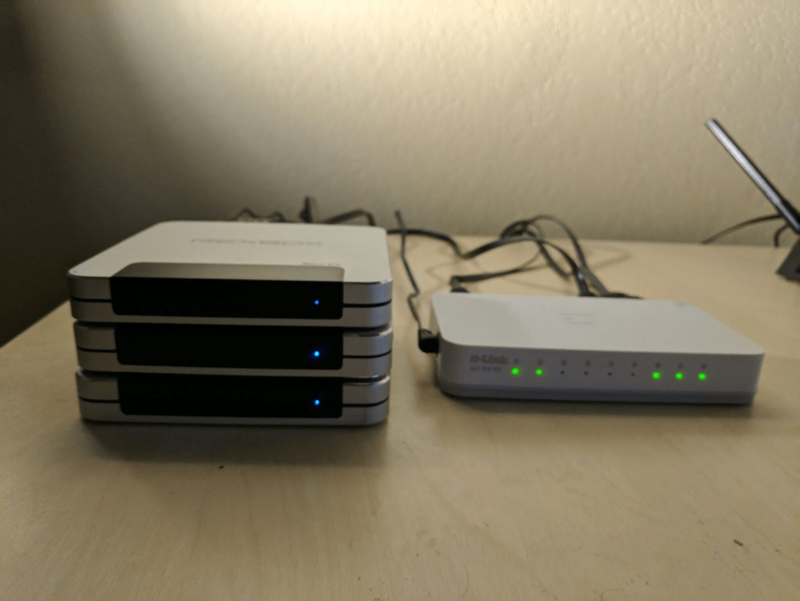 This guide will show how I created a bare-metal continuous-delivery appliance using Spinnaker, running on a Kubernetes cluster of “mini pcs”. Why build a bare-metal cluster? Because it’s fun! Many times when using a cloud platform, much of the magic gets abstracted behind dashboards and APIs. When you set up your own cluster from scratch, it really helps to connect the dots and learn about how the pieces fit together. The cloud is not cheap. Running Spinnaker in the cloud is quite pricey due to the resource requirements. When we run this on our own hardware, we pay up front around as much as one month in the cloud, but we can run it forever! Free up resources. There are tools like minkube that allow you to set up your own single node Kubernetes cluster on your laptop. However this ties up resources. It’s very nice being able to use an always running cluster on your network without needing to constantly “spin up and spin down” environments. Total control. Running a cluster via minikube or GKE is very convenient. However with bare-metal we can tweak our setup to our heart’s content. Want to install an nfs server for persistent volumes on a node? Go for it! Want to experiment with the Ubuntu Kubernetes distribution? Install the iso on a node! There is less magic and more “nitty gritty”. It really helps you understand how things work from the core. Put your spare compute to work. It’s really satisfying to have your own “on prem” equipment. 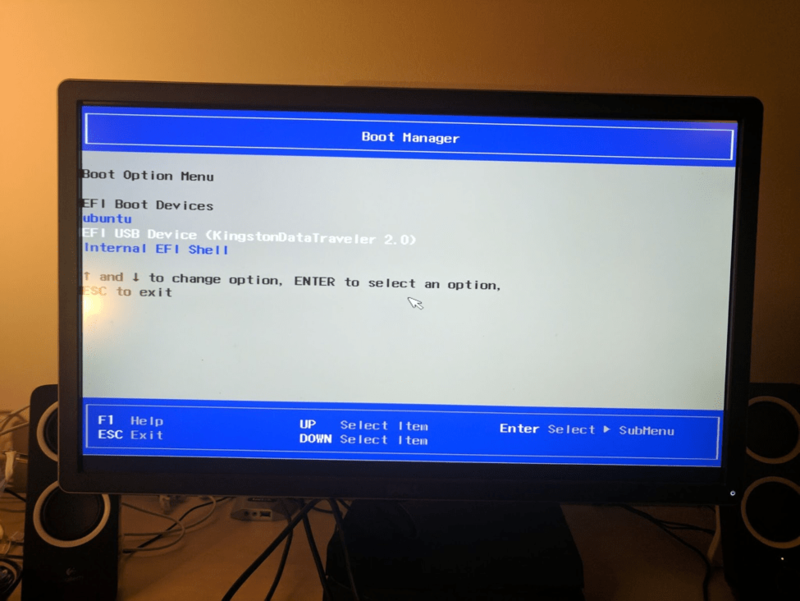 How many of us have raspberry pis or old desktops/laptops just laying around? Instead of just collecting dust, we can add these nodes to our fleet. We can then run jobs or applications that distribute this load. You can put the cluster behind your router and host web sites or run home automation applications. All without the overhead of the cloud. Plus it looks really cool sitting on your desk! 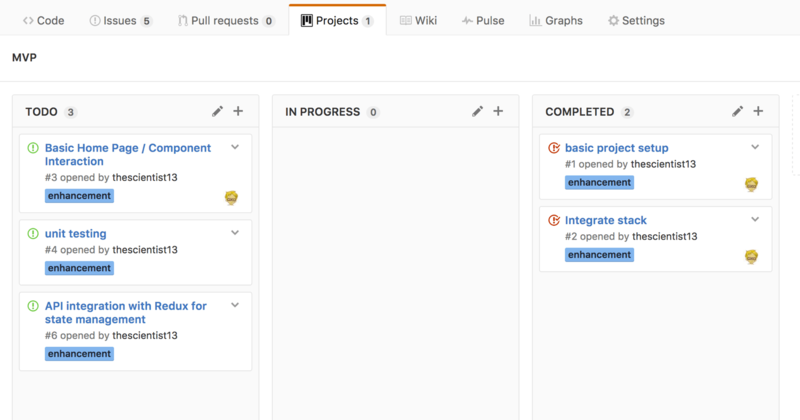 http://www.spinnaker.io/ is set of microservices that make it easy to build continuous delivery pipelines. Contributors to the project include Netflix, Google, Microsoft and Kenzan. The project brings together best practices and patterns for easily deploying immutable infrastructure style software. Deploy targets can be instances or containers running on a multitude of platforms including AWS, GCP, Azure and Kubernetes. Spinnaker can be run from any of the above platforms, however due to the nature of the resources needed it can be quite expensive. 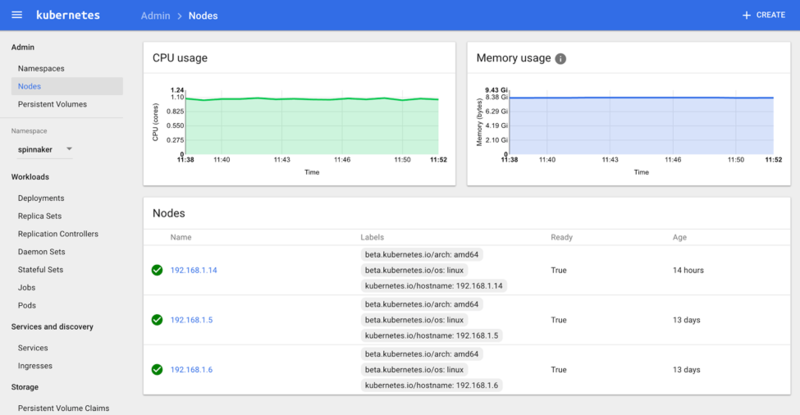 Kubernetes allows us to set up our own “cloud” on bare metal. We can then use our Spinnaker instance to easily deploy to other cloud platforms or clusters. It’s also pretty neat having a self contained “appliance” running Spinnaker. Hardware prices are constantly falling and it is pretty fun experimenting with software on our own “datacenter”. While I was able to get the cluster turned up with the first version of this guide, The “Stick pcs” proved to be too weak on the memory requirement. I needed nodes that had at least 4gb memory. After some searching I decided on three “nexbox” pcs. 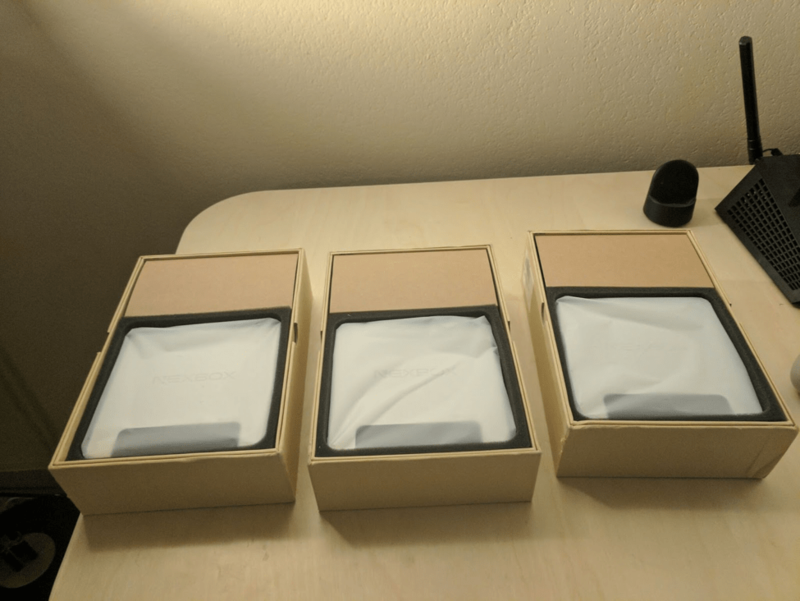 It took a while for the boxes to arrive from Aliexpress but I was excited to get started when they did. Unlike the tv-sticks, these boxes came with windows installed. That was not good for the cluster, so I began by trying to install Ubuntu server. Unfortunately since the chipset in these machines was “cherry trail” it had limited Linux compatibility. 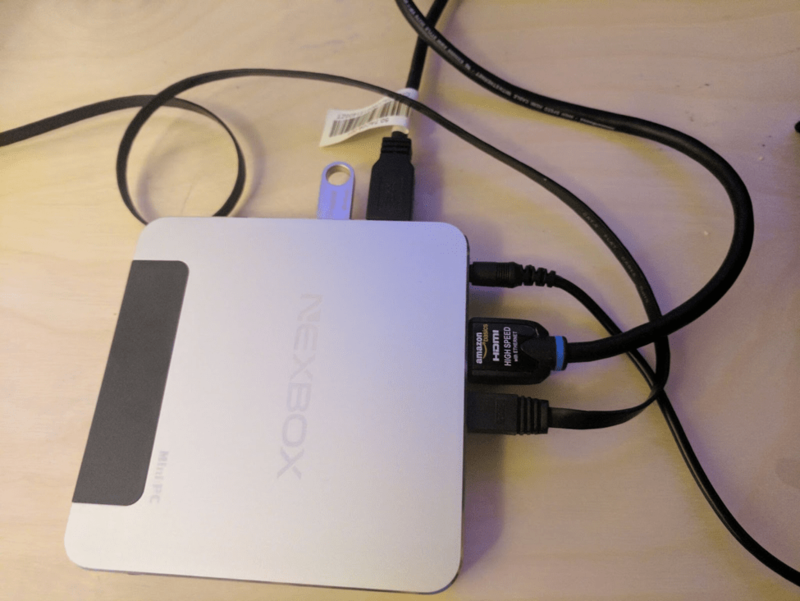 The nic did not work at all during install. Burning the image to a thumb drive, I was then able to hold the ESC key and boot from the drive to install. With Ubuntu installed on the boxes I was now able to install docker on each node. I leveraged the docker-multinode scripts to get Kubernetes installed along with heapster and the dashboard. Installation is relativly simple, you run the master.sh script on one node and worker.sh on the remaining two nodes. Tunneling 8080 into the master node and the dashboard displayed like a charm. I then was able to make some minor modifications to the “spinikube” specs and get Spinnaker installed. Overall, I’m very happy with how the cluster turned out. It’s great to be able to have a dedicated cluster without wasting resources on vms. I’m looking forward to running more workloads and monitoring performance. The next step will be to experiment with getting persistent volume storage in place with ceph or gluster. It will be great to take advantage of all the storage on the nodes. Stay tuned for part 2 of this guide, where we leverage Spinnaker to do a deploy on the cluster, along with some other advanced functionality. Chad Moon is a platform engineer at Kenzan, based out of the Denver office. Specialties include crafting continuous delivery pipelines and containerizing all the things. Current work includes integrating Jenkins, Spinnaker and Kubernetes for large enterprise clients. Have questions about building your own Spinnaker-Kubernetes cluster, or just about Continuous Delivery in general? Comment here or tweet at us: @kenzanmedia. As more businesses prepare to make a digital transformation, containers have become the choice cloud computing architecture for faster, more portable and reliable deployments. With the growing interest in containerization, the question arises about how containers integrate with existing infrastructure. In this post, we will look at how containerization affects service discovery and present a network routing solution that allows NetflixOSS Eureka to provide unified discovery between both containers and with VM-based services. Kenzan specializes in cloud technologies with extensive experience in Amazon Web Services (AWS). 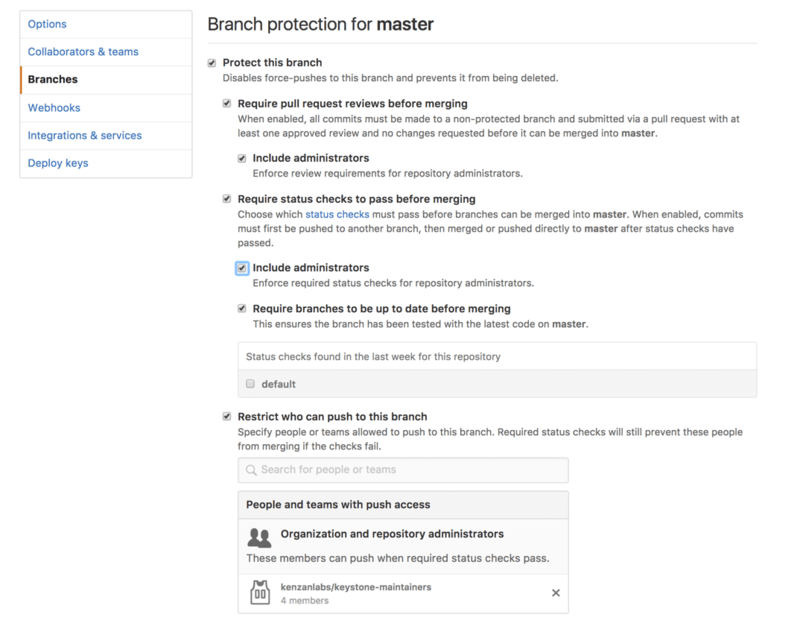 We have adopted a number of tools from the NetflixOSS stack for use in AWS, such as Zuul, Ribbon, and Eureka. The discovery service feature of Eureka allows us to build dynamically scalable AWS environments without the need to setup fixed routing and load balancing infrastructure. Docker introduced a new networking layer that changes everything we know about networking in the cloud. This makes discovery and routing with Eureka challenging. Containers have their own IP addresses, belong on a different subnet, and are only routable from the host running the Docker daemon. We have experimented with tools like flanneld that create virtual networking layers between Docker hosts, allowing for cross-host communication between Docker containers. Flanneld is easy to setup and does as advertised, but requires hosts wishing to network with containers to be running the flannel daemon. All-in-one Docker solutions like Kubernetes do everything from networking containers to orchestrating and managing multiple Docker hosts, but still cannot network with containers from outside the Kubernetes cluster. What we are looking for is to spin up containers like we do with EC2 instances, have them register with a discovery service, and allow us to send traffic from anywhere in the VPC. Let’s start simple with a cluster of Docker hosts, which is something that EC2 Container Service (ECS) will provide us. We launch a few applications as Docker instances using ECS, but we get containers that can’t talk to each other and can’t be reached from any external service. As an application in a discovery-based world, you need to tell the discovery service who you are and how others can reach you. This is easy on EC2 instances because the application can provide the host IP address and the port it’s listening on. Containers in Docker are given IP addresses that are only routable to containers running on the same Docker daemon. We can expose internal container ports as host ports, but that port (which port? That = ? )has to be static and non-conflicting with other containers on the same host. e want to be dynamic and not have to remember which ports are used versus which ports are free. 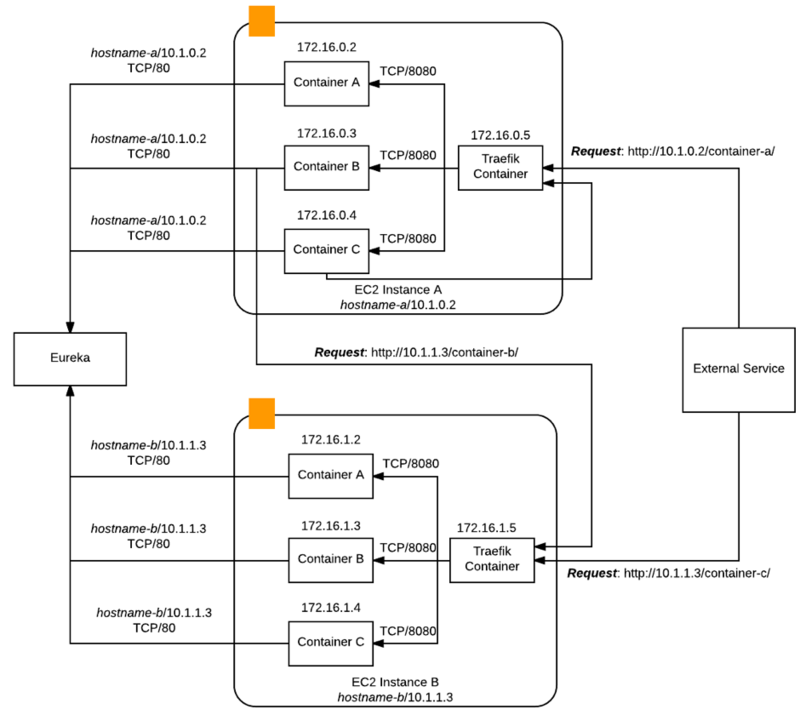 ECS provides an option to expose containers through an Elastic Load Balancer (ELB). Issues with ELB’s include consuming several VPC IP addresses, requiring management of limits on how many ELB’s can be created, and adding additional AWS costs. Our applications now have to remember a series of hostnames representing ELB endpoints for each environment, adding more configuration overhead. ELB’s have the advantage of security groups, which is something we may expect to lose in a container world. The new networking layer on top of Docker does not play nicely with network based firewalls like security groups in AWS. The goal is to find a non-conflicting dynamic way for containers deployed to a cluster of Docker hosts to identify themselves to a discovery service and have their identity be reachable. To achieve this, we need a tool that will find other containers on the host and route traffic based on a series of rules. Traefik is that tool. Traefik is a discovery based HTTP reverse proxy and load balancer that can discover Docker containers with minimal configuration, as well as several other means of discovery. That’s it. The front end is now listening on port 80. Notice what we did here is we mounted the docker.sock file as a volume launching the container. This gives Traefik API access to the Docker daemon so that it can find other containers. We added an Nginx container, and added a Label of traefik.port=80. Traefik will use the Docker metadata API exposed through the mounted unix socket to find container labels and bind the listener to port 80 that Nginx is listening on. 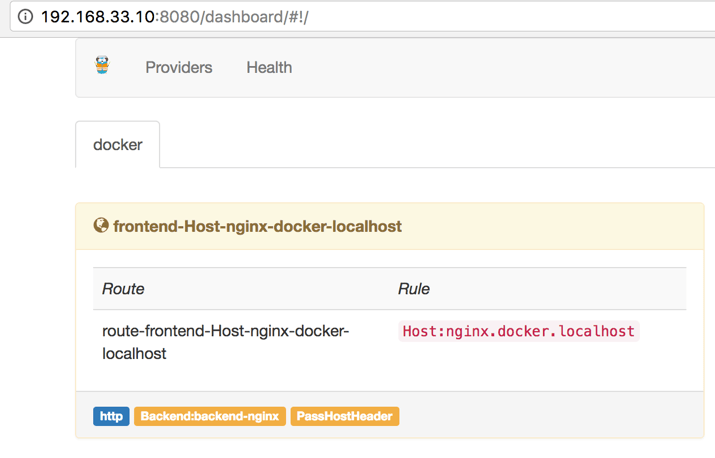 Notice how the Rule is Host:nginx.docker.localhost. This is a combination of the container name we provided to Nginx with the –name argument. The docker.localhost part of the domain came from the –docker.domain=docker.localhost we gave to Traefik at startup. Running a curl to the Docker host with a Host header of nginx.docker.localhost returns the Nginx welcome page. Traefik is routing requests with this Host header to our Nginx container. We didn’t tell Traefik to do that, but it did (and that’s alright). We can use other labels attached to the Nginx container to control how Traefik routes requests to it. Let’s try a path based rule. We of course get a 404 since our nginx doesn’t have a /test resource, but we can see in the Nginx logs that the requests are coming through. That was a quick proof-of-concept to show how quickly we got Traefik running as a discovery based routing service with Docker. By putting a Traefik container on every Docker host, we can dynamically setup routes to our containers running on those hosts. All we need to do now is identify our containers to the discovery service as the host IP address and the port that Traefik is listening on. The applications calling the services have to remember to include the path prefix in the request. Below is an architecture diagram showing Traefik set up on multiple Docker hosts. Darren Bathgate is a technical architect at Kenzan. Over the course of his 5+ years at Kenzan, Darren has worked extensively with Java, MySQL, PHP, Cassandra, Node.js, oracle, Jenkins, Netflix OSS and Docker. From the cloud, to the Internet of Things, to big data, companies are embracing digital transformation to help them quickly react to marketplace shifts, consumer demands and new opportunities. The roadmap for digital transformation is different for all companies and often calls for customized software, which can be a significant investment of time, money, attention and resources. Software development can sometimes be seen as a slow and expensive process, especially at the enterprise level. Managing these factors are fundamental priorities and few people are better equipped to keep things under control than project managers. Many organizations that are on a path towards digital transformation don’t fully recognize the value PM’s add to software development teams. According to a 2016 report from the Project Management Institute titled “The High Cost of Low Performance”, less than two in five companies surveyed place a high priority on creating cultures that recognize the importance of project management as a driver of better project performance. That’s not the case at Kenzan, where our project managers play a central role on each development team and are vital for success. We’re not the the only ones that have seen the positive results of project managers. Organizations that invest in project management waste 13 times less money because strategic initiatives are completed more successfully. Myth: Project managers are clueless. Busted: Technical comprehension is as critical to the success of a project as leadership and strategic business management. While a PM doesn’t write code, they spend their days working with those that do. In order for a PM to adapt quickly to changing conditions, assign and re-prioritize tasks, communicate effectively and spot risks, they need an understanding of relevant tools and technologies that the team uses. Myth: Project Managers just schedule meetings and manage calendars. Busted: Project managers guide the structure, scope, quality and budget of a project while also representing the interests of the product owner. The real value of a project manager is as a leader, liaison and mentor. With a big picture point of view, the project manager balances and guides software development teams while defining requirements and goals to ensure the teams meet expectations — on time and on budget. Myth: Project managers are just paper pushers. Busted: Project managers define policies and procedures that enable success. Without the structure of process, a project can easily fall apart. A project manager knows the operational requirements (things like time sheets, budgets and resource allocation) and can navigate communication channels with clients so technical team members can focus on what they do best – developing software. Myth: A Project manager’s top priority is execution. Busted: Project managers support the team from start to finish. While the software delivery lifecycle (SDLC) is the guiding framework for development, it doesn’t stand alone in supporting and achieving business objectives. Project management methodologies work in tandem with the SDLC for the initiating, planning, monitoring and delivery of projects, which provides consistency and stability of process through every phase of the SDLC. Now that we’ve dispelled some of these major misconceptions about project managers, it’s (hopefully) clear how important they really are. Think about all the projects you or your organization have worked on that went over budget, missed a deadline or derailed entirely. It may be too late to go back and right those wrongs, but it’s not too late to consider how future projects — and your company as whole — will benefit from the guidance of project managers. For companies that are looking to get or stay competitive, strong project management practices can play a crucial role in driving the business forward through digital transformation. Contact info@kenzan.com to learn more about our project management and other services. As a certified Scrum Master in Agile methodologies, Jennifer Aczualdez leads Kenzan’s project management and business analysis team . She manages the scope, budget and timelines of projects and acts as a central point of contact for both internal and client teams. She is involved in the full software delivery cycle, from initiation and planning to monitoring, delivering and closing.